Today I’m writing this with pleasantly aching legs and shoulders after completing a 13 kilometre run in the sunshine with the husband and my two long-suffering dogs, Miles and Lola. Chris and I are planning to run the first Hoad Hill Half Marathon together in August so we are very gradually building up the distance we run on our long run we do each week. Next week I will probably do another 13 kilometre run as today I really struggled for the last two kilometres. When Chris gets tired he talks more to distract himself and when I get tired I talk less so it works out ok.
We went for something to eat at Low Sizergh Barn and then had a look in the shop and I got very excited when I spotted some of Mike Barlow’s books in there, and some of the pamphlets that he publishes from Wayleave Press as well. I bought William Gilson’s new pamphlet after reading the first poem, which is very good. I also like to buy poetry if I see it out in the open and in an unexpected place, like a gift shop in the hope they will continue to stock it! Yesterday I did Barrow Park Run, and after a couple of good runs recently and all the hill running I’d been doing in Crete, I thought I would push myself to see how close I could get to my PB. I managed 23.27 which is only 18 seconds of my PB so I was very chuffed and feel full of beans and ready to have a go at the Dalton 10k this Friday. I’d like to try and get close to 50 minutes but I have no idea if this is a bit unrealistic, as it is a pretty hilly course but I will have a crack at it anyway! Last night was Poem and a Pint with guest poet Beatrice Garland and my very own South Lakes Brass Ensemble as the musicians. It was at Greenodd Village Hall and at 7.25, five minutes before it was due to start there was about four people in the audience, not counting the brass ensemble. We were also dressed in our customary black which I realised looked like we’d come from a funeral, but never mind. Anyway, my heart was beginning to slowly sink as I thought about Beatrice (who also hadn’t arrived by that point) coming into a rather large village hall and being greeted with four people and a funeral party. Then suddenly, people started arriving and we ended up with a full room! Lovely Danny, who is the singer from the Soul Survivors turned up with his wife when I told him I’d be playing which I was really touched by. I don’t think either of them had been to a poetry reading before but they seemed to enjoy it. Rather bizarrely, our local MP, John Woodcock also turned up and read a very short limerick about the election which you can find on his twitter page if you are so inclined. I admired him for getting up and reading a poem and I also felt a bit sorry for him as he got collared by various people and complained at, or told that they were voting Green, or asked about this or that. It was Saturday night after all – and he had read a poem which I think should have given him a free pass out of politics for the evening. Then again, it is his job! The really weird thing was that even though the open mic performers and Beatrice didn’t know he was there, they read quite a few political poems. Beatrice read a great poem about working in the NHS. I was suprised how much politics seeped into people’s poetry in a way I haven’t noticed before. Another strange thing – Beatrice read quite a few poems about falling and then came and told me she’d just written a poem called The Art of Falling, inspired by Elizabeth Bishop’s ‘The Art of Losing’. Maybe falling is going to be one of those things that everybody writes about like bees were a couple of years ago! Thank goodness my book is out already! After the interval I had to switch into musician mode and I performed with the South Lakes Brass Ensemble. The most popular piece seemed to be Pastime with Good Company which we played to start off, and ‘The Nearness of You’, which is a Hoagy Carmichael number arranged to feature the French Horn. Someone came up to me and said that it had made them cry, which my sister as the soloist was very pleased about. I was doing the introductions to the pieces and I couldn’t believe how out of breath I was from playing – it was like I’d been for a run. I don’t know why I keep being suprised lately by what a physical thing it is to play the trumpet. The rest of last week was all given over to rehearsals – Monday night with the junior band, Tuesday night with the South Lakes Brass Ensemble, Wednesday with the Soul Survivors and Thursday with the South Lakes Brass Ensemble. Poetry-wise, I spent Thursday finishing off a review I’m writing for Under the Radar magazine. The two books I’m reviewing are The Years by Tom Duddy and Common Ground by D A Prince, both published by the marvellous HappenStance. I really enjoyed writing this review and I also love working with Maria Taylor, who is the Reviews Editor. She is always very patient with me, and finds a way of correcting my sometimes rather silly mistakes without making me feel silly or stupid. On Friday morning I finished off the review and then planned my workshop for Dove Cottage Young Poets which I was running in the afternoon. I left at lunchtime to have a quick meeting with Ian at Abbots Hall Art Gallery. On the 15th May the art gallery are having an event called ‘A Night of a Thousand Selfies’. There will be lots of stuff going on – music, a photobooth, a temporary tattoo artist, free pizza and drinks and an open mic, which I will be running. I’m looking for more poets to read on the Open Mic, so if you are interested, please get in touch, or have a look here for more information. I’m feeling more and more excited about next Wednesday, which is the first public reading from The Art of Falling. The reading is in Leeds at the Heart Cafe in Headingley and I’m reading alongside John Foggin, Andrew Forster, Keith Hutson, Peter White and Mark Connors. It would be great to see any of you there if you happen to live within striking distance of Leeds. It has been a strange feeling, having a box of my books living underneath my desk like some sort of hibernating pet. So many of my friends have got in touch to say that they have bought copies already that I’m beginning to doubt the wisdom of buying a box of 100 – am I being too optimistic? We will see – I’ve got a few readings coming up, and although I know how fast my pamphlet sells, I have no idea how fast the book will sell – it is going to be a bit of a learning curve. At the minute there are no plans to sell the book through this blog, as you can get a copy with 20% off direct through Seren. If you would like a signed copy, make your way to one of the readings on the ‘Readings and Workshops’ page or email me! So today’s Sunday Poem is by Terry Quinn, who I met quite a few years ago now. I can’t actually remember where we met – probably at an open mic in Lancaster actually. I’ve been meaning to ask Terry for a Sunday Poem for at least two years. His collection ‘The Amen of Knowledge’ came out with Indigo Dreams Press in 2013 after he won the Geoff Stevens Memorial Poetry Prize in 2012 and I read it, thought ‘ooh, I must ask Terry for a poem’ and then forgot to actually ask. Well, I never claimed to be organised! Terry Quinn was born in Birmingham and settled in Preston in 1995. He retired in 2012 from his career as a Medical Engineer in the NHS. Terry has been active in the local poetry scene for over 15 years and is Vice President of Preston Poets’ Society. As well as his Indigo Dreams publication which you can get hold of a copy of here Terry also published another collection in 2010 called ‘Away’ published by Poetry Monthly Press. He has been published recently in The North, South, French Literary Review, Acumen and Ink, Sweat and Tears. His poem is featured on the BBC Poetry Proms website as a runner up in the competition and if you find yourself in Guernsey, you will see one of his poems on a bus! Terry also has a blog here if you would like to find out more about him. I’ve asked Terry for two poems, because they are only short ones and I liked them both too much to choose between. ‘Wishful Thinking’ makes me laugh because my husband really did once come home and say ‘I almost bought you some flowers today’. But there is also something really sad in the last verse – if it was being read out, it is probably one of those poems that would make you laugh in the first verse and then feel guilty for laughing in the second verse. ‘Couples’ is so completely right with its description of one of the tribulations of being alone that I had to ask for that one too. I like the linebreaks in ‘Couples’ as well, especially the words ‘One’ being on a line by themselves – it has a William Carlos Williams feel to it as it falls down the page. Thanks to Terry for letting me use two of his poems, and apologies that it has taken so long to put them up! Evening all – this week has been another busy week (is there any other kind?) It feels like I’ve been in non-stop rehearsals. On Monday I had junior band rehearsal as usual and then Wednesday I had a rehearsal with the Soul Survivors, the nine-piece soul band that I play in. It’s the first rehearsal I’ve been to in a month because I’ve been away. On Thursday I had a rehearsal with the South Lakes Brass Ensemble – we are the musicians for the next Poem and a Pint on April 25th, held at Greenodd Village Hall. The event starts at 7.30pm and it would be great to see some of you there. The guest poet is Beatrice Garland. Traditionally, our numbers go down when we go out into the village venues, so I hope any Cumbrian admirers of brass music, poetry or open mics will come and support us and Beatrice, who is travelling all the way from London to read in South Cumbria. After the rehearsal with South Lakes Brass I went straight to the Nines Nightclub in Barrow for a soundcheck with the Soul Survivors, ready for our gig on Friday night. The soundcheck can be a frustrating process and it is so different to playing in a quintet, where the players control the volume that they play at, or at least they are supposed to! At the soundcheck the sound engineer has control over the sound of the band, having to mix everything that he gets through the speakers to get the right balance of sound. Sometimes there is random feedback with no logic as to why it is there. It is like there are little ghosts in the wires and the speakers that like to make mischief when they feel like it. Luckily we have an excellent sound engineer and it all got sorted in the end – but we were rehearsing there till 11.30 when the bar staff let us know that they wanted to go home! The gig on Friday night was amazing. It sold out within a couple of weeks of the tickets going on sale. We were playing to over 350 people at The Nines nightclub in Barrow but there was a great atmosphere in the room – it being Barrow most people seemed to know each other. It was lovely to see so many of my friends there as well – poets, runners, teachers, teaching assistants amongst many others. I’ve played in lots of different bands in the last twenty years – orchestras, chamber orchestras, new music ensembles, big bands, jazz bands, brass quintets, brass ensembles, brass bands but I think playing in the Soul Survivors is both the most challenging and the most rewarding. For both of the gigs we have done so far we have done two sets which are about an hour long. It is physically hard work. You have to play in the same position because you are playing into a microphone so after a while your shoulders and your arms start to hurt. It is always too hot on stage with the amount of bodies in the room and the stage lights, which often feel like what I imagine it must feel like in a tanning studio. The music is not usually technically difficult, but it is usually quite high. I woke up the next morning after the gig feeling like I’d done a half-marathon again – I was aching all over. This might sound like I’m moaning, but I actually really enjoy playing in the band, but I guess I’m learning now how physically different it is to the other types of playing that I’ve done. The other thing that is enjoyable is the other people in the band are really great – we have such a good laugh at rehearsals. We have quite a few gigs coming up over the next few months so I will keep you posted. My friend, the poet Keith Hutson also came up on Friday to the gig and then stayed for the weekend to help me and Chris with the garden. We also had my running buddy Jeff and Chris’s friend Eddy helping out to. I am normally very squeamish about insects but I don’t know if there are less about or if I was just not noticing them, but I only saw one slug which fell onto my arm from a bit of chopped down tree I was carrying and a worm when I was sitting on the floor eating my lunch. Apart from that the insects didn’t bother me and I really enjoyed working at something which I didn’t have to think about too much – my job was getting rid of a huge pile of chopped down hedge from the bottom of the back garden to the front garden so the council can hopefully come and pick it up next week, so I could just get on with it. Keith has rotovated the lawn and put down grass seeds and the fence has been concreted in. I can’t wait for the grass to start growing – at the minute it looks like a bit of a wasteland. Today me and Keith had a poetry day – it has been ages since I’ve sat down with a friend and looked at each other’s poems which was really useful for me as I’ve been telling myself for ages that I’m not writing and that what I am writing is rubbish. To get a more balanced view on it was really useful. Keith has a really exciting pamphlet in the making, exploring the lives of Troupers – artistes from the past but he is also writing about masculinity and what it is to be a man and also what it is to play a role. It’s really interesting stuff. This morning before our poetry marathon we went for a run with the Walney Wind Cheetahs and did the Dalton 10k route. I am absolutely chuffed that I managed the distance without my injury flaring up and at a pretty good pace as well which I’m really pleased about. This week writing wise there have been lots of exciting things happening. I have been interviewed on the Seren blog and you can read the interview here. Seren also made ‘A Psalm for the Scaffolders’ their Friday poem and you can read it here. So today’s Sunday Poem is Greg White. It seems like years ago that I met Greg but actually it was only last October at Ilkley Literature Festival. Greg read some beautiful poems about dementia and also some very funny poems as well. I bought his book ‘best before’ which is a beautifully made thing with lovely paper and a cover, but also it is jammed full with fantastic poems, so much so that I asked Greg if I could use two of the poems for the Sunday Blog this week. Greg says I wrote poetry at school, but I found my way back to it as an adult by blogging about my Mother’s dementia. Writing was a strategy to help me focus and deal with my fright at witnessing her rapid decline, but it brought me friends from around the globe and I eventually found myself helping support others going through the same experience with their loved ones. “best before” is an on-going project, with blog episodes constantly resolving themselves into further poems. The eventual collection is likely to be about 100 poems long, but I can’t say when it will be finished since my muse is always distracting me with more whimsical work about unrequited love, bathroom fixtures and biscuits. My mate John Foggin does an ‘Undiscovered Gem’ feature on his blog and I think Greg is definitely one of those He has had poems in three locally published anthologies ‘The Garden’, ‘Spokes’ and ‘How Am I Doing for Time?’ but apart from that he hasn’t had any poems published in magazines. It is rare to find a poet who writes so well who hasn’t got into submitting poems to magazines yet but I think I have found one! ‘exam’ does its work really well – describing with accuracy the guilt and conflict felt by a carer. This is good poetry though with lots of rhymes to hold it together not just the subject matter – betrayed and changes as a half rhyme, clue and you as a full rhyme. I like how Greg is also exploring how the roles of parent and child have been reversed – he is the one anxiously looking after his mother. only I can see in you. then asks you for the month, the day. You guess wrongly at these two. August is late spring, you say. from a hundred, it’s clear you can’t subtract. can you name them? Yes. you copy what he’s done. You tell him that you’re finished, but you’ve only sketched one. The exam had ended, and you glow. how you can think that this went well. because it’s me who’s passed today. Because I’m relieved to see you fail. My Mother has quite gone away. Who this is I cannot say. 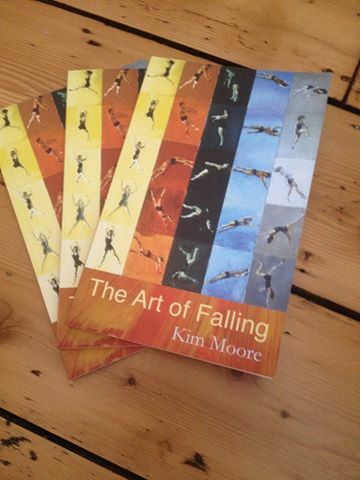 Below are details of three launches for The Art of Falling. It would be great to see you at one, two or even all three if you are feeling particularly keen! Bennett Road, Headingley, Leeds LS6 3HN. The event is free and starts at 7.30pm. I’ll be reading alongside Mark Connors, Andrew Forster, John Foggin, Keith Hutson and Peter R White. I will also be launching the book on the 28th May, a bit closer to home at the Supper Room in the The Coronation Hall, Ulverston, LA12 7LZ After a short reading, I’m hoping there will be enough people to have a party because a nine piece soul band, The Soul Survivors will be playing. The third launch will be taking place in London on the 13th June at The King and Queen, 1 Foley Street, W1W 6DL – further details to be confirmed. Evening all – if I have done this right, this will be published on Sunday at 5.30pm, while I am away in Crete. The wonders of technology. I’m actually writing this blog on Friday night just after midnight. I’ve been away all week tutoring on a week-long residential course with Carola Luther. We had 16 lovely, talented poets signed up for the course and it has been a great, if intense week. My lovely friend Lindsey Holland is staying at my house this week, looking after my dogs and she picked me up from Grange and gave me a lift back to Barrow. I slept for about an hour and then since then I’ve been packing. Our flight goes pretty early in the morning – we are having to leave at 2am so it seemed pointless to go to sleep and then wake up feeling terrible. So this week’s Sunday Poem is appropriately set in another country. Peter Jarvis was born into an early-settler family in Mashonaland, Zimbabwe and was educated there and in South Africa. He did postgraduate studies in Scotland at St Andrews and later Stirling universities. He worked in African education in Zimbabwe, then in Fife for 25 years. In 2000 he returned to Botswana as part of a team of British Council teachers and enjoyed a thorough immersion in African village life. There were two further postings in Namibia as adviser and teacher. I first met Peter at the birthday party of a mutual friend, Antony Christie. Back then, my pamphlet had just come out, and Peter’s was, I think in the pipeline with Happenstance. I saw Peter again at Stanza this year, when he introduced the event that I read at with John Dennison and was really happy to finally see his finished pamphlet Nights of a Shining Moon which I read in one setting. The poems are set in Africa and are beautifully written. They have a calmness and sureness about them which I think you can see in the poem I’ve chosen. I like this poem because of its story though, told in the voice of a Lesotho shepherd. I thought I’d post this today because we’ve been looking this week on the course about the different ways we can tell stories in poems, and this poem uses one of the oldest, and best tricks in the book, which is to write the story in the voice of a character. Although this isn’t a long poem, the characters have real colour and presence. I like the mother who runs and shouts at the owner, and the kindness of the owners wife. I like the consequences of the kindness, that the dogs go hungry. There is also that lovely line about learning to sleep with hunger, and teaching the stomach not to want food. This poem is not just straightforward though. It has an air of strangeness to it in that line ‘The lightning means the witches want to kill us’. My favourite part of the poem though is the list of useful things. I love that finding water and finding food is given the same importance as making music and taming animals. If you would like to order Peter’s pamphlet, you can order it through Happenstance and make lovely Helena Nelson, his editor a very happy lady. Thanks to Peter for letting me use his poem. must give you gumboots and a kobo. a cow, or two or three sheep. cows are not so difficult. plants as medicine for my cuts. She ran and shouted at the owner. I was not allowed food. gave me the dogs’ food. That night the dogs went hungry, not me. I can teach my stomach not to want food. you can say a jackal took it. Your shepherd friends may back you up. I leave behind village noises, village smells. The lightning means the witches want to kill us. So I wear a rubber necklace. I’ve learnt in a difficult school.